Stay on the Trail, and Learn From the Mistakes. If you've been watching my instagram stories or checked out my posts lately, you can tell I have been non-stop "Oooo"ing and "Aaah"ing over the Virgin Mountains. I posted up on BLM land just north of Lake Mead National Recreation Area in the Moapa Valley of southern Nevada last week and spent the majority of my days pre-occupied with thoughts of "when will it be sunset, already!" or where I should locate myself for the best view of Virgin Peak as it lit up each evening. Seriously, I think I spent a whole day cleaning the van just because I didn't want to drive anywhere new to explore and risk losing my campsite and perfect view of the amazing sunsets. I scanned my Garmin InReach (highly recommend getting something along these lines if you're spending a lot of time off the grid, seriously clutch) and found the name of the mountain range and that the peak I'd been drooling over was Virgin Peak. I couldn't find any trails to hike it on my Garmin maps, so I hopped on the ol' computer for a google search. Two people had posted about hiking to the peak from a 4x4 road on the south side of the range in Gold Butte NM, and one had even left his waypoints. Problem solved, I woke up early and drove over on Saturday. After stopping nearly a hundred time to take pictures of signs and the peaks and rock formations and the like, I finally made it to the base of the 4x4 road. Russ, Rex, and I camped there for the evening (Rex is a beast but that low ground clearance and two-wheel drive of his is definitely a known limitation, so we didn't dare the two miles up the washed out rocky road to the trailhead), and woke up dark and early to get a move on. The valley portion of the hike isn't so bad. There are trail markers every once in awhile to remind you you are on a designated trail. You pass an old old old corral with a rusty catchment tank and the bare bones leftover from an old pickup. The desert plants slowly begin to share their soil with coniferous trees and you hear birds chirping and catch them flittering about. At waypoint 3 I ran into another old ranch property of some sort. This one had more metal utilities, though I can't be sure what the contraptions may have been used for in their glory days. Another skeleton of a truck is up there. And then a dirt road / path leading up the mountain side. The waypoints indicated I should head along that way, and I did. Then suddenly the path disappeared and we found ourselves on all fours (well, I guess Russel always is) scrambling up a couple hundred feet of elevation gain over sharp bushes, cacti, and what I'd describe as slate rock pieces on this mountain side. I was certain I'd lost the trail and it would pick back up on top. When we finally made it over the crest and up on to the spine, the view was awe-inspiring. (Side note: I feel like awful should be a positive word, as in full of awe. Don't you?) There was a slight mountain breeze and the air was a clear as can be. I could see for miles. 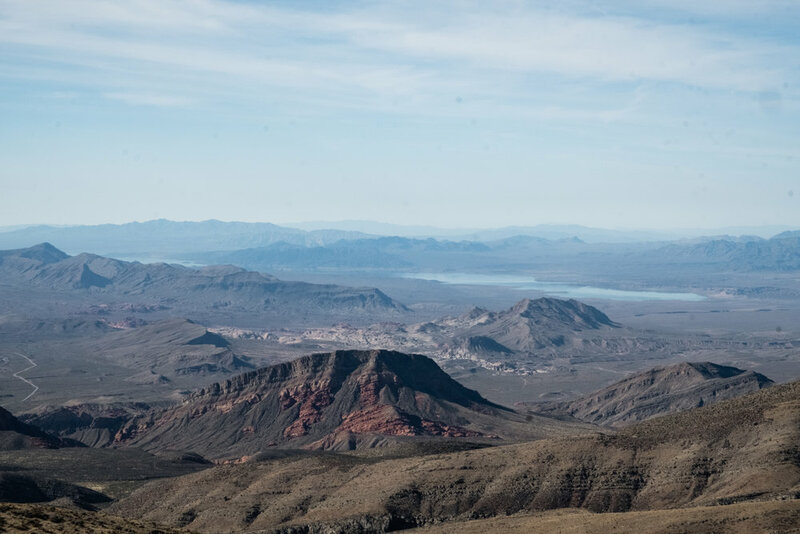 From that mountain ridge you can view the majority of the land protected by Gold Butte National Monument, the Moapa Valley, Valley of Fire State Park, Lake Mead National Recreation Area, Grand Canyon-Parashant National Monument, and plenty of the Grand Canyon! Absolutely incredible. It was exactly what I'd hoped for, and I could and should have turned around and went home fulfilled from there. Nope, I was being head strong. I couldn't quite see the top of Virgin Peak over the next few spines and peaks I had to cross, but the GPS was saying it was only a few miles as the crow flies. I should have also realized that - as the crow flies, not on foot. There seemed to be hints of a trail here and there, and I remembered reading in the one man's recount of his hike that the trail is faint but just follow the mountain ridge, there's no need for it anyway. Soon the grassy ridge quickly turns into a dense forest with new growth of more coniferous trees, a bunch of bushes both dead and painfully scratchy and living and pokey, yucca plants, and more cacti. I felt like I could see hints of trail here and there, and pushed on - ducking under branches and taking absurdly large steps over the bushes as needed. A couple hours passed and we were what seemed like indefinitely at .7 miles to the peak on the Garmin. I was on the last mini peak before reaching it, but the forest was dense and we'd been on the trail for hours. Seemed like a great time for a snack break. We drank tons of water, shared some cashews, and avoided getting back up for a couple minutes. Russel and I were beat, already. We hadn't even made it half way yet, we still had ALL THAT WAY left to go back. So I decided to take one more good hard look at the view from the top (or nearly the top) and turn back. Of course, as I turned back and was looking downhill now, I started to recognize more trail and was kicking myself for not having been able to see it earlier. The way back ended up being much quicker, as I feel it always is on a hike. We decided to switch back and forth across the side of the mountain in a less rocky area than we'd climbed up. I fell, way too many times. Russ did too. We dragged ourselves back to the car about ten hours after initially setting out to hike, cleaned ourselves out, and feel into deep slumber. Walking back down the road to the van I found I was extremely frustrated with myself for having blindly followed some stranger's waypoints off trail and along an unfamiliar and potentially dangerous terrain. After the next morning's drive where I found the information boards on this land and realizes what ACEC means, I was kicking myself for being so reckless and irresponsible and potentially/probably damaging the mountainous environment, Here I am, trying to save public lands, knowing how fragile some environments are and that trails are there for a reason, yet ignoring my gut and pushing onward. And for what? It's not like I was proving anything to anyone, or need to. The view right when I reached the ridge never got better with the hike, so I wish I had turned around then, when I realized there wasn't a true trail any further, and not disrupted this landscape any more than I had. As much as I'm kicking myself for that mistake, I realize I learned a lot on this hike, and that we all make mistakes - what is important is that we learn from them. The way back gave me ample time to reflect, on top of all the clarity being in the outdoors brings me anyway, I won't be so careless as to threaten an already threatened environment again down the road, and I hope you've learned from my mistake and won't attempt to summit Virgin Peak or to stray from the designated route next time you find yourself in a protected environment. You can view more photos from Nevada in my gallery, or by clicking here. Happy weekend you all!